Violence ricochets from wall to wall in "Windows on the War: Soviet TASS Posters at Home and Abroad, 1941–1945." Based on a long-overlooked Art Institute collection, the show offers an encyclopedic installation of 157 epic-scaled, World War II-era Soviet propaganda posters whose graphic style is at times as visceral as their shocking content. The artists' agenda, after all, was to mobilize the masses to fight invading Nazis. Bayonets are a recurring motif and the blood flows. Even a comparatively domestic image—Viktor Deni's 1943 "The Red Army Broom Will Completely Sweep Away the Scum"—shows a stalwart defender of the homeland wielding a broom fashioned from a rifle bristling with 14 bayonets. The technology for creating the images involved cutting up to 70 stencils per poster. Hitler's monstrous face is rendered in 25 colors in one piece. The works were most commonly displayed in windows around Moscow and other cities; slide versions appeared in portable light boxes at rail stations and other public places. 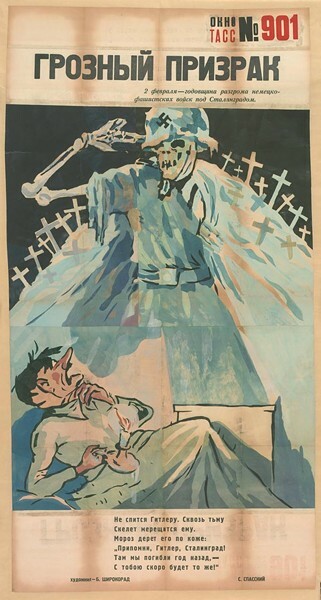 TASS began to produce and distribute the posters within days of Germany's invasion of the USSR on June 22, 1941. There was continuity in color-coding: red for lean, heroic communists, black for demonic fat capitalists and bestial Nazis. Imagery got recycled. The soldier that Leonid Pasternak depicted in his 1915 "Help For War Victims" reappears in a poster titled "The Price of Blood." 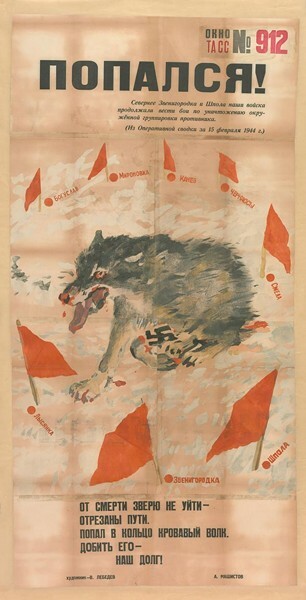 The 1941 poster "The Wonders of Fascist Photography" educated viewers on how to deconstruct Nazi propaganda that depicted Soviet POWs as "subhuman." A sequence of four panels shows a Nazi photographer outfitting and posing his models. "We Are Russian Prisoners," says the ironic tagline in an English-language version made for international export by VOKS (the All-Union Society for Cultural Relations with Foreign Countries). Poster shipments went to the Art Institute and the Chicago Forum for Russian Affairs—and also to American artist Rockwell Kent, who argued in January 1942, "If we can out-produce the world in guns and tanks and planes, we can out-produce them in propaganda." A few months later a London advertising industry leader declared, "Posters, however clever, are a waste of paper unless they kill Germans." "Windows on the War" makes no particular aesthetic claims for the posters. More artful agit-prop can be seen at "Avant-Garde Art in Everyday Life," showing nearly concurrently with "Windows" in the museum's Modern Wing. But the posters' emotional power is another matter. The most effective works, write Douglas W. Druick and Peter Kort Zegers in the catalogue introduction, "pack the visual equivalent of a one-two, heart-head punch." A visitors services staff member stationed outside this intense history lesson told me that "people have come out crying." There's even a blackboard and chalk set up near the exit to allow patrons to vent. In his foreword to the catalogue, former Art Institute head James Cuno equates "Windows" with the 1991 exhibition "Degenerate Art: The Fate of the Avant-Garde in Nazi Germany." He doesn't draw parallels to the present, however, and neither do curator Peter Zegers, research associate Jill Bugajski, guest curators Adam Jolles and Konstantin Akinsha, or other contributors. "Windows" only tacitly asks what the U.S. counterparts might be, in the post 9/11 decade, to Soviet measures to depict enemies and engineer morale. "We seek neither to pass judgment on the Soviet politics under which they worked nor to examine how these individuals submitted to, or rebelled against, the exigencies of war and daily life in a totalitarian state," Druick and Zegers insist, a tad defensively. That refusal obliges us to judge the artists, reporters, filmmakers, and publicists who shape the public vision of our own enemies in wartime. Art Review Windows on the War: Soviet TASS Posters at Home and Abroad, 1941-1945 Art Institute of Chicago Viktor Deni Vladimir Mayakovski Leonid Pasternak TASS Douglas W. Druick Peter Kort Zegers Jill Bugajski Adam Jolles Konstantin Akinsha "The Red Army Broom Will Completely Sweep Away the Scum" "The Wonders of Fascist Photography"